Claire has been working as an Audiometrist for the last 3 years, first as a student completing her work experience and then as a trainee Audiometrist with Expert Hearing Care. 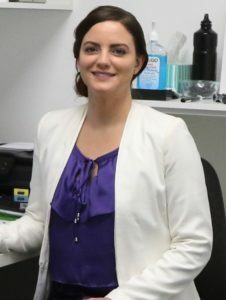 She has recently completed her training at Expert Hearing and gained her certificate of Clinical Practice (CCP) from ACAud (Australian College of Audiology). She first became interested in Audiometry while studying a Bachelor of Health Science at Edith Cowan University. Her main interests are in rehabilitation of adults and management of tinnitus. When she’s not at work she will be found spending time with her fiancé, taking her dog “Diesel” for walks, going to gym classes, reading, watching movies and relaxing. • Full/ordinary membership with ACAud (Australian College of Audiology). 2016. • Diploma of hearing aid prescription and evaluation. OTEN University/TafeNSW. 2015. • Bachelor of health science. Edith Cowan University. 2012.